1	Preheat the oven to 200°C, gas mark 6. To make the bread dough, put the flour into a bowl with the salt. Add the yogurt (plus 1-2 tablespoons of water if needed) and knead to a fairly stiff dough. Once the dough comes together, don’t bother trying to knead it until smooth, just wrap it in clingfilm and leave it to one side to relax. 2	Peel the squash and remove the seeds. Chop the squash into 2cm dice and scatter onto a baking tray. Drizzle generously with 2 tablespoons oil and sprinkle over a decent amount of seasoning. Roast for 40-45 minutes, until soft and a little caught at the edges. 3	On a floured worktop divide the dough into 6 portions and roll each one out into a disc about 18cm in diameter. Place the discs of dough into 6 small lightly greased ovenproof bowls, approximately 700ml in volume, lining the bowls with the bread. Bake for 15 minutes, until lightly golden and slightly puffed up. Remove the bread from the bowls and allow them to cool and crisp. 4	For the curry paste, put all of the ingredients into a food processor with 2 tablespoons of water and blitz to a coarse paste. Heat 2 tablespoons of oil in a large saucepan over a high heat and add the paste. Fry for about 5 minutes, stirring constantly, until the paste is extremely dry – I can’t overemphasise the importance of drying out the paste. When the paste is dry, add the curry spices and fry, stirring, for 30 seconds, then add the tomatoes and reduce the heat to medium-high. Allow the tomatoes to cook down for 2-3 minutes, stirring occasionally, until they are mushy and the oil has risen up through them. 5	Add the stock, bring to a boil, then reduce to a simmer and cook gently for 15 minutes. Add the lentils and chopped coriander leaves, along with the squash, when ready. 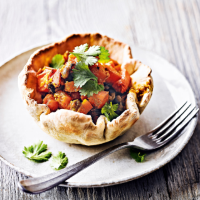 Allow everything to warm through, then serve the curry in the naan bread bowls, with boiled rice and chutneys.